I once heard that Amma, the hugging saint, magically seemed to double in size overnight as soon as she embraced her dharma and began sharing her gifts. It was as if her body had to grow huge to hold all the love she gives to the world. I can relate. I have been teaching yoga for 8 years and am keenly aware I am quite often the biggest person in the room. Ten classes a week, I guide a room full of yogis, most of whom are literally half my weight, through challenging, mindful, vinyasa practice. I love teaching and practicing yoga. Yoga allows me to know truth. I know I am strong, flexible and quite graceful. I know I am blessed to have a loyal following of amazing yogis who co-create a vibrant community. I know I am grateful to feel more love than I ever have. I also know that as my classes have grown in size and vibrancy, so have I. 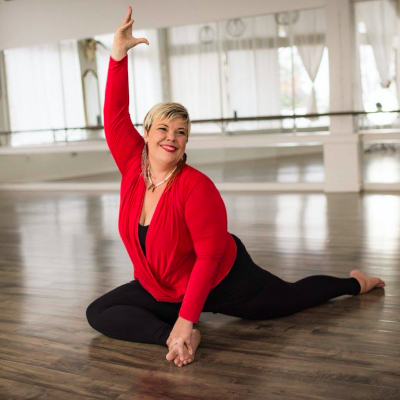 When I began teaching, I was already a curvy girl defying the yoga teacher stereotype… that was 52 pounds ago. I thought I was fat then. I was constantly dieting; low carb, no sugar, no wheat, no dairy, no alcohol, prescription diet pills, hcg with extreme low calorie diet, eating for my blood type and/or dosha. You name it, I’ve tried it. I always achieved temporary success but the pounds eventually came back with a dozen or so friends. Truth is, I hid beneath the guise of self improvement. I didn’t know how to love myself. I sought attention and validation from others because I could not give it to my own sweet self. My marriage was on the rocks and I fought to control something, anything, the only thing I thought I could; my weight. This familiar battle I waged with my body felt comfortable as I had been warring with my genetic tendencies of obesity for years. When I got divorced, I stopped the dieting madness, worked on body acceptance and loving myself. I have always been a loving, open hearted girl, but I had been focusing all this love outward and had very little left for me. I now have a trusted high counsel of women who helped me bring the light of awareness to my shadow. My journey for the last few years has been all about forgiveness and self love. It works like magic, when I focus on forgiveness, the more love I have. The irony is the more I have learned to love myself, the more weight I have gained. More to love. I really adore stories; reading, hearing, and telling them. I find Hindu myths particularly compelling as the gods, goddesses and heroes are imperfect and the stories are rich with metaphors. We can glean much wisdom relevant to our modern day lives from these ancient tales. When I demo headstand, for instance, I can feel the students thinking “huh, well ok, maybe if she can do it, I can give it a whirl.” Everything about me defies labels, industry standards, and societal norms. I know this is refreshing for students. Because I am navigating the world in this form, I have developed an uncanny ability to see potential in my students and mirror it back to them. I clearly see the gift in what, for most of my life, I thought was a curse. My perception has transformed and yet the obstacle of my weight remains. In truth, it has grown. One might think self love and body acceptance is the ultimate goal and if you truly feel them you’ve won, you’ve done the work, you’re good, right? That’s certainly what I believed was happening to me, but the ego is more clever than that. Recently, I have found myself still hiding. I hide behind loose clothes and lycra. I hide behind my skinny friends and right camera angles. Perhaps my ego’s most clever hiding spot is behind the guise of body positivity and a rebellion of societal beauty standards. I’ve been preaching about creating authentic relationship to true power by reclaiming all parts of ourselves through self love, yet, I was avoiding a part of myself that desperately needed to be held. I was refusing to step on a scale, even at the doctor’s office, and wearing only stretchy pants. I wouldn’t look at this shadow side and managed to put on over 50 pounds in 4 years. Weight gain is so obvious but still I hid, mostly, of course, from myself. Now I find myself at a crossroads. How do I remain truly loving and look with clear eyes at every part of my precious self, my patterns of unhealthy behavior, and courageously take the next steps I need to take for my optimal health and well-being? I ask for help and allow myself to receive it. I look at all my options with a clear lens while I evolve out loud. I listen to nutritionists, and bariatric surgeons. I listen to my high counsel of women. I listen to my intuition. I ask questions. Most importantly, I forgive myself. I forgive myself for not looking sooner, for hiding in plain sight, for the shame I felt when I finally stepped on the scale and I forgive myself for the return of the harsh voice inside me I have worked so very hard to silence. Yoga is a path of self discovery. I sit with all parts of myself: the critic, the rebel, the scared girl. I sit with complacency and determination, apathy and resolve, sadness and fury. I welcome all parts of myself home. I bless it all. Could it be that every one of these pounds is a sacred gift, that they’ve come on for a reason? It seems it has taken me weighing more than I ever imagined I would to truly embody self love; as if my body, too, had to grow in size to hold all the love I have for the world and still have enough for my own beautiful self. Ganesha is known to jump up to aid anyone who calls him, without hesitation, offering abundant blessings. Amma is known to sit for hours and hours generously holding all who come to receive her love. I pray to Ganesha to jump to my aid in holding every single last bit of myself as unconditionally as Amma holds every single soul who is ready to receive her love. Let me release every pound with love and respect. Let me receive the full magnitude of my heart’s capacity to love. I am ready.